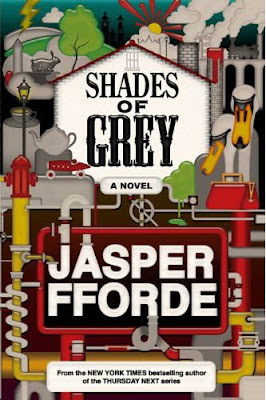 Jasper Fforde is best known for his Thursday Next series and the spin-off series of sorts called Nursery Crimes. Shades of Grey is the start to a new unrelated series, which saw its release delayed for a little while, but things are now on schedule for a release right after Christmas. Here is the blurb followed by the cover originally used when the book was first announce followed by the just released and most likely final art. 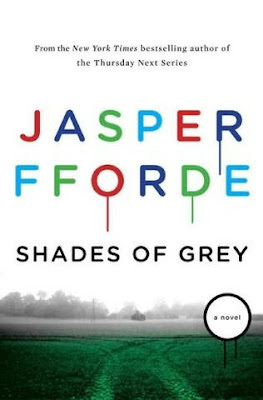 I liked this version when I first saw it, but did feel it was a bit austere for a Jasper Fforde book. I love the new art and wonder if it will have a die-cut cover given the title art. Either way I think it fits much more with Jasper's other covers. It especially reminds me of the UK covers, which are brillant. Also, Jasper recent paid Joseph Mallozzi a visit where he talked about Nursery Crimes and a few other things. I really like the new art. I have been anticipating this release as I've enjoyed his other works.